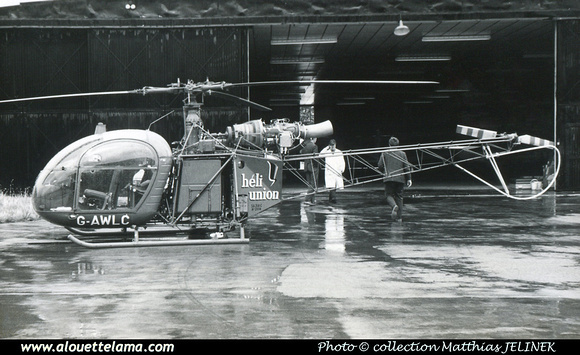 Dollar Helicopters Ltd; extensively damaged in Kenya while operating in support of the Nissan rally team. Dollar Helicopters Ltd; substantially damaged in heavy landing at 4480m near Tabubamba in Andes. Dollar Helicopters Ltd; reg cld; wreck sold in the U.S.A.
Roberts Aircraft Company, opb Geo Seis Helicopters; substantially damaged near Cody, WY, during logging operations. G-AWLC Eurocopter (Aérospatiale) SA318C Alouette II Astazou MSN 2014, Heli-Union (U.K.) Ltd - United Kingdom - Photo Matthias Jelinek collection. Dernière mise à jour/Last update : 08-03-2012. L'usage des logiciels Firefox ou Safari est recommandé. The use of Firefox or Safari browsers is recommended.